Posted: 14/09/2012 - Snail painting giveaway competition. Posted: 06/07/2010 - New forum reference section. Posted: 06/07/2010 - New species page - Achatina zanzibarica. Posted: 06/07/2010 - New picture added to the Mites page. 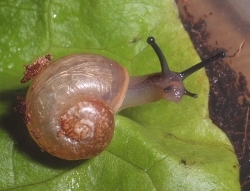 Posted: 06/07/2010 - New Snail Mix page added. Posted: 03/06/2010 - Pictures added to Achatina varicosa the page. Posted: 02/06/2010 - Classifieds section retired in favour of speciestrader.com, a new site that allows buyers and sellers to find each other. Provide potential snail owners with information on keeping snails as pets. Hopefully, this site will tell you all you need to get started. In many cases the information is quite detailed and not all of it will be of interest or use to everyone. To that end, it may fail as a 'just the basics please' kind of site. However, this site was born from a hunger for snail information and the struggle to find it. Don't be misled by that, there are great sites out there, but they all contain varying levels of detail and focus. Most hobbyists tend to get carried away with their hobby and thirst for information. This site is intended to fulfil that thirst and provide newcomers with all the information they may desire. Be a point of reference for existing snail owners. Hopefully, the information that is on here currently and the contributions from other snail owners will become a point of reference for both newcomers and more experienced people alike. We also link to more detailed information on other sites wherever possible.